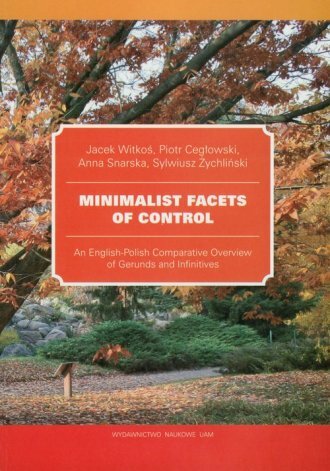 In this monograph we discuss a large number of phenomena concerning the derivation and interpretation of infinitives and gerunds in English and Polish. We amply support our discussion with examples with the aim of placing our findings in a wider context of the current theoretical debate on control engulfing minimalist circles and concentrating on two major approaches, i.e. the approach based on movement (started in Hornstein 1999) and the theory based on Agree (articulated in Landau 2000). A succinct outline of both approaches is followed by enumeration of major theoretical and empirical points of the debate, which sets the scene for an ensuing analysis of data from Polish in such areas as case inheritance and case independence in control constructions, subject control across an object, partial control and finally control into gerunds and adjuncts. The data from Polish are considered through a contrastive lens, with an eye towards corresponding English facts and analyses that explore them and are available in the literature. In a few cases a theoretical argumentation is supported with empirical research in the form of questionnaires and a psycholinguistic experiment.